While shopping the day after Christmas for my fabulous New Year’s Eve dress, I also picked up a black & white tee from Express that says “Tres Chic Tuesday”. It’s one of those really soft cotton tees that I love and as it was 50% off I couldn’t say no. I wore it this past Tuesday (of course) and decided that I would transform the outfit from day to night wearing the same shirt and pants. As always, anything that is still available for purchase (to my present knowledge) is linked below. During the day I was running around all morning/afternoon to various furniture stores and to eat lunch. Oh yeah and I stopped by a basketball game for my high school students too. Since I was running around all morning/afternoon I wanted to be comfortable but stay true to the “Tres Chic”! I wore this oversized bat wing cocoon cardigan, stretch cords, my tee, and UGGs. The sweater takes a little bit of getting used to especially with the huge sleeves, but after the first bit of feeling like you have wings, it’s actually quite comfy. That night my family and I went out to dinner to a restaurant we’ve been wanting to try. It’s about 35 minutes away and I will have a full review on that coming up soon! Anyway, since my whole purpose for this outfit was to show that I could easily transfer it from day to night, I kept the tee and the stretch cords on. I switched out the cocoon cardigan for a charcoal blazer and the UGGs for sparkly, black flats. 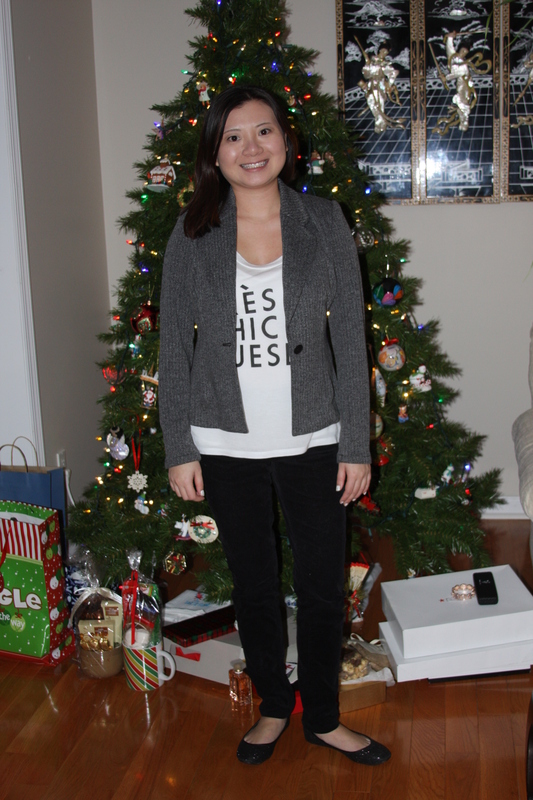 Love the blazer – it was a gift from my parents for Christmas. I have one other blazer, which is black so the charcoal is a really nice option and this one is a bit more fitted to give a different look, line and style. I’ve had these flats for years, but they’re still in great shape. The sparkly-ness might be wearing off a bit due to time and standard wear and tear of wearing these shoes in all different kinds of weather. I think I successfully pulled off a day to night look and hopefully I can do something like this again soon!